One of the many things that made this year's G8 and G20 meet-ups a pointless exercise in photo-ops was Stephen Harper's unwillingness to urge action on anthropogenic climate change (ACC) with the other attending nations as he deemed the subject matter to be too controversial. It's a sad commentary on his short-sightedness that now, only two months later, were such a meet being held Global Warming would likely be at the top of the agenda. Two months can be an eternity in politics and apparently the same is true for the course of ACC. This is nothing new for our PM and the Conservatives who have consistently blocked any and all actions on climate change. British author George Monbiot wrote that Canada was the nation that has done most to sabotage a new climate change agreement at the Copenhagen summit and prominent University of Victoria climate scientist Andrew Weaver stated that Canada’s actions were even worse than that of the Bush regime. A great example of the unforeseen consequences of a rapidly changing climate are the great swaths of trees are dead or dying after being attacked by the mountain pine beetle and a disease called white pine blister rust - these forests were once protected by harsh winters and cool summers, but no longer. 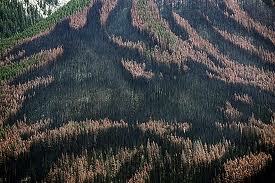 This is also affecting Canadian forests and are expected to wipe out 80 per cent of B.C. 's pine forest by 2013.